We believe in using only the highest quality products. Our experience and attention to detail guarantees long-lasting repair and quality replacement of all garage doors and garage door components. In fact, most of our products and services carry a lifetime warranty, which includes all parts and labor. This warranty is not pro-rated like many of our competitors’ warranties. Whether your garage door is broken, slowly deteriorating, or you simply need a new garage opener or remote, we can help you. We specialize in repair, maintenance, and installation of garage door springs, cables, rollers, panels, remotes, and keyless entry devices. We have a wide selection of beautiful garage doors available with numerous window, hardware, insulation, color, and texture options to add functionality and a customized look to your home. 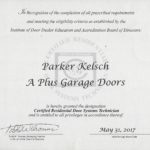 A Plus Garage Doors strives for a level of excellence not matched anywhere along the Wasatch Front. We maintain our inventory and keep trucks stocked and maintained so that we can offer same day service, in many cases, to handle any kind of garage door emergency. We have over a decade of experience, and offer a 100% warranty on our work. 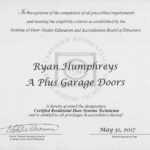 This means that you can have confidence when choosing A Plus Garage Doors. We are locally owned and operated, so we will be here when you need us. Call us today for any of your garage related needs! Call A Plus Garage Doors to upgrade your garage door and improve the look of your home today. quality. If you are fortunate to get Sterling, he will go the lengths for you. would highly recommend these guys! A Plus tomorrow morning. Very satisfied with the service we received. options for service and answering questions. use A+ again when my next garage door goes out. What Does the IDEA Mean to You?